Maryland Native Plant Society - Field Trip: "Plants, Insects, and Birds"
Field Trip: "Plants, Insects, and Birds"
The meadows on this reclaimed land have plenty of goldenrod and blue vervain in September. A mix of wooded and open habitats along the nature trail will provide many opportunities for seeing (and photographing) wildflowers and insects. This is a good spot for birding, too. This is a flat hike, though it can get muddy, and if it has been raining there may be a stream or two to ford. Directions: From Route 108 between Olney and Laytonsville, take Zion Road to the parking lot north of Brookville Road. Bring: Camera; hat; water; appropriate shoes; field guides; binoculars. Contact: Albert Hartley by e-mail at albert@sprucemt.com with the subject "MNPS field trip" or call 301-251-2253. 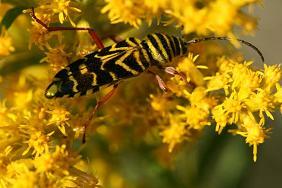 Photo Credit: Locust Borer Beetle on Goldenrod at Blue Mash, copyright 2008 by Albert Hartley.